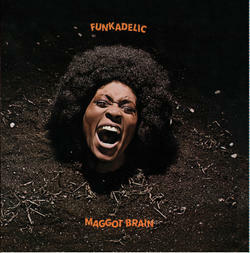 1971's Maggot Brain is Funkadelic's all-out masterpiece. Absolutely no one working in soul and funk at the time had the scope, or vision, to pull off the kind of record that George Clinton and his collaborators have made here. Eccentric funk jams are book ended by two of the heaviest tracks ("Maggot Brain" and "Wars Of Armageddon") ever committed to tape. The title track, and album opener, is nothing short of mind-blowing, Eddie Hazel's guitar is a revolution brought on by Clinton asking him to play “as if your mother just died”. An essential classic and the deepest album to come out of the Parliament-Funkadelic camp. 180 gram vinyl in a deluxe classic style gatefold sleeve.